Navigation links are now at the very top of the page to allow larger proof images to be shown. Visit the Gallery to browse the latest images. Having spent too long looking at points totals this year I though it was time for a different way to show the top 10. Over the weekend I had the chance to display a few photos and the 1 Day at Shelsley Walsh timelapse in the old canteen at Shelsley. Though it was a very last minute thing I decided it was worth the effort as it's not an opportunity that is likely to repeat itself any time soon. The rush did mean that there were some rough edges that could have been done better but overall I was pleased with how it went and it was nice to get some direct feedback on what people liked. I really wasn't thinking of it being a chance to sell photos so I'm sorry to anyone that asked me about prices and I looked totally confused. I've always focused on selling the digital files, as I think it gives you the most flexibility on sizes, mountings, etc and it also keeps the cost down, so I was struggling to come up with a figure as I was also unsure of the costs of the frames etc. I had been awake till the early hours framing the prints so probably wasn't my most alert! Though I'm unlikely to be at Shelsley in September - another trek to Doune & possibly Bo'ness is calling - the exhibition should be open again for anyone that wants to view it then. The other people who displayed work were Geoff Robinson, Shireen Broadhurst, Derek Hibbert and Becca Parker - who also did most of the organising. For a while now I have wanted to try creating a photosynth of Shelsley. A photosynth takes a large number of photos and analyses them to recreate a 3D scene that you can view and move around from photo to photo in. I think the Shelsley paddock should work well for this as there is plenty of structure to detect but, as I was a bit concerned that the moving cars would confuse the system, I decided to start from the courtyard for a first test there. You can view the results below. I don't think the viewer is that user friendly but click around and you should be able to figure it out. Please let me know what you think of it. Do you think it is worth starting work on a version covering more of the site? While the batteries are on charge ready for a weekend at Gurston I thought I'd make a quick update here. After a couple of bitterly cold weekends at Shelsley and Barbon/Harewood it has been great to have two nice weekends at Loton Park to warm back up again. In a perfect world that would mean the good weather is here for the summer but it looks like the waterproofs will be coming out this weekend. Last Sunday was the Party in the Park at Loton Park. H&DLCC had a superb entry of cars including Ferraris, Ultima, Porsche, Caterham, Dodge Viper, Subaru Imprezas, Jaguar XK,Lancia Stratos and Cosworth Sierra for the event where visitors could have a ride as a passenger up the hillclimb track. They also had static displays including the 2003 Le Mans winning Bentley Speed 8, a display of Classic and hill climb cars, a demonstration of skill by the Autotest team, and a Trials car section when you could see what its like to be a passenger. The event was to support Midlands Air Ambulance and Alberbury Church. I thought I'd have an experiment and focus on trying out video for the day. The clip below should give you an impression of what the event was like. Hopefully it is something that they can repeat in the future as it was a great day out and seemed to be very well received by all the people that attended. A couple of people have mentioned they have been seeing an error message when browsing the site or trying to purchase images. I have made some changes to hopefully stop this happening but if you do have any problems please use the contact link to the left to send me details of what is happening and I'll try again. Thanks. Well, here we go. The British Hill Climb Championship (and Midland) is underway again and, if things go to plan, I'll now be on the hills every weekend till October. Just typing that is quite daunting and I hope I can keep the motivation up. Having just finished sorting out the photos from the weekend I have been reminded how much time it takes away from the hills to get everything sorted. Though Prescott was my third hill climb weekend this year I'm still feeling very rusty and really aren't that happy with the results. 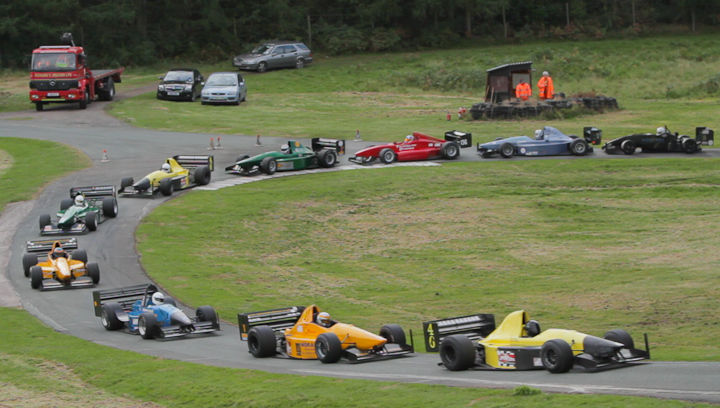 Hopefully I'll do better this weekend at Shelsley for the next round of the Midland Championship. I'm sure a bacon & brie bagettue, which I avoided at Prescott as it should remain a Shelsley Special, will sort me out. Thankfully the marshals, rescue & medics that were at Prescott don't seem to be rusty and delt very smoothly with the incidents of the weekend. I won't go into details, partly because it is quite confusing what you see (BBC have an interesting series on eyewitnesses that I'm meaning to catch up with), but it's something I really don't want to see again. So what else is there to say... The Top12Runoff runoff site has become active again over the winter. The main reason I maintained a championship table here last year was because I couldn't find another public source for one. Since that site is now being maintained that should probably be used as official standings. I have already written the code to produce the table here so I may as well try to keep it updated and will get that done shortly.